We walk into the Sant’Angelo dairy and the first thing we see is a crowded dairy shop, and Signora Patrizia, who is busy trying to please everyone, asks us if we need any help. We tell her we are looking for Mr. Mauro, so she takes us to see him in the room next door where he is with a family of tourists from Rome who have come to see how Grana Padano is made. Before we even sit down, he asks us if we would like a coffee. It was already prepared and was actually his coffee, but he's happy to give it to us. We sit down at his crowded table where the guests, Mr. Marco with his wife and four children, share with us their thoughts on what they saw during their tour of the dairy. What struck them most was the team spirit of the employees. Mauro explains that it couldn't be otherwise as all the work has to be perfectly interlinked so it is essential for everyone to act in unison. Another detail which stuck in the mind of these guests is the fact that even though technology helps, most of the work is still done manually and is the result of human experience. So, ultimately, there is innovation but tradition rules. The youngest member of the family interjects by asking if it's possible to eat the curd. Mauro explains that it is actually okay to taste it but it's definitely better to be patient and wait for 9 months for the finished product. He goes on to explain that once the cheese mass is taken out, the whey is left over from the processing and in the old days it was given to the pigs. This whey is good for the pigs because it can be used instead of water with the advantage that it contains nutritious lactose and proteins. As well as taking the family around the production plant, Mauro has also given them Grana Padano at different ageing stages to taste, so they can understand the difference between the cheese aged 9 months, over 16 months and the reserve variety, and thus capture the “vitality” of this constantly evolving product. He then goes on to talk about the differences between Grana Padano and Parmigiano Reggiano, not thinking about it as a competitor but as a cousin, with different characteristics, but still a PDO cheese. In the conversation we also discuss how to make home-made cheese and even butter. From butter, we go on to talk about “ricotta”, which takes its name from the fact that the whey left over from the production of Grana Padano is re-cooked, “ri-cotto” in Italian. After this experience the children would like to organize a “Grana Padano Summer Camp”, and their parents would like to see a “Grana Padano Boutique” somewhere in Italy or one of the big cities in the world. All in all, we've heard a lot of stimulating great ideas during this unusual meeting. Our Roman friends leave to continue their holiday and, after a ritual photo, Mauro brings us back to the Latteria Sant’Angelo and tells us about its distinctive features. He takes us to visit the cheese plant and, as it's now 1 o' clock, the cheesemaking activities are over and the staff are busy cleaning so that everything will be in perfect order when production starts again the following morning at around 5 a.m.
We end our tour in the new offices, where work is still underway. Mauro can't wait to move into the new spaces where, at last, he will have more room to store all his materials and perhaps also a member of staff to whom he can delegate some of the work. 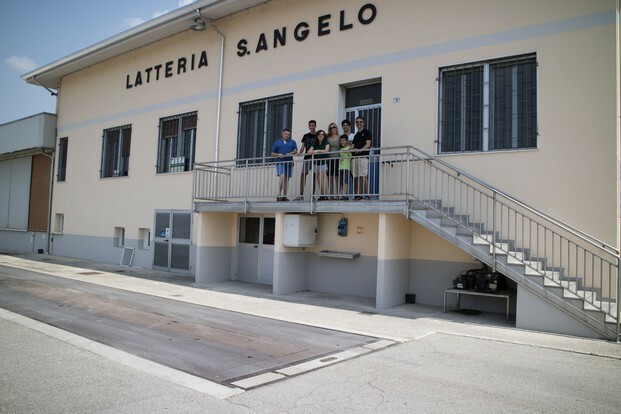 Our thanks to the Latteria Sant’Angelo dairy and to its precious staff for the passion they've shown us.